Natalie Portman on Millie Bobby Brown Being Her Lookalike: She's Her 'Own Magical Person' - Integration Through Media ....! Ever since a Twitter user placed a photo of Natalie Portman next to one of Millie Bobby Brown, fans haven’t been able to shake it: the Stranger Things star looks like a Portman clone! 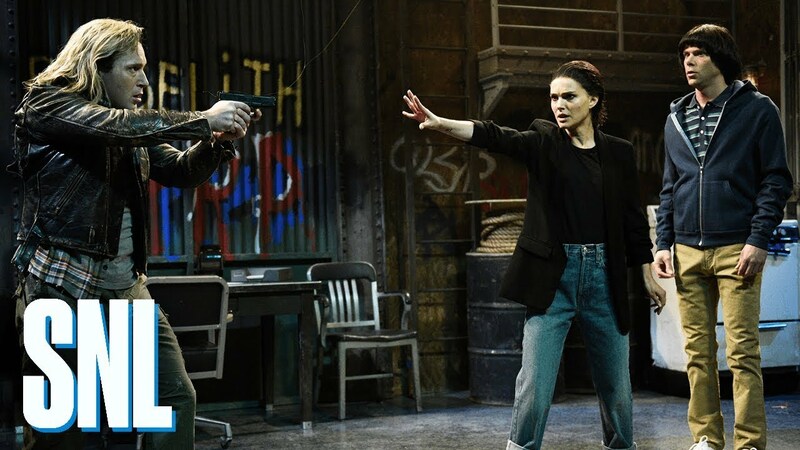 The Annihilation star only fueled the comparisons further while portraying Brown’s beloved character, Eleven, during a recent skit on Saturday Night Live. Despite the obvious similarities – both have shaved their heads for roles, started in the acting business at a young age and are queens of the sci-fi genre, for starters – Portman doesn’t want anyone living in her shadow. Portman does, however, admit that she understands why fans are seeing double. Brown, 14, retweeted the interview with a sweet message to her doppelganger. “Was a dream come true meeting Natalie! So beautiful and talented,” the actress wrote. Portman isn’t the only A-list celeb in Brown’s ever-growing fan club. Everyone from Lea Michele and Aaron Paul to Drake and Laverne Cox have lined up to snag selfies with the Stranger Things star. After Brown revealed her obsession with the Kardashians on The Tonight Show Starring Jimmy Fallon, the family shot the praise right back at her. “It’s a mutual love fest! !” Khloé Kardashian tweeted, with Kim Kardashian West and Kris Jenner also sending messages.